The white bread is a classic. No doubt about that. Although I have baked "No Knead/The world's best bread" for years, the French bread somehow still leaves the kitchen a lot faster when I bake that :-S So there must be something to it that other loaves simply does not have. I often use this simple and quick recipe that never fails, and does not require anything more than a conventional oven to make. It provides a finished bread in 2 hours. Crumble the yeast into a bowl. Dissolve the yeast in approximately ½ dl (1/4 cup) of milk. Melt the butter in a small saucepan. It is important to just melt it. Don't let any browning take place. Add the remaining milk into the pan with the melted butter. Milk and butter mixture should just be as warm as you little finger. Combine all the ingredients in bowl. Let it raise for approx. 30 minutes until doubled in size. Shape the bread into a ball by pushing it into itself from the bottom. Continue until the surface is tight. If it is difficult to work with, then let it rest for 10 minutes. Press the bread into an elongated shape by folding it in half, and loosely clamping it together. Do this 3-5 times, and finish by pressing it firmly together where there is a fold. Roll out the bread into a thin log, until it is as long as your baking pan is wide. Usually about 30-40 cm (12-16 inches). Use a little flour so it does not stick to the board or fingers. But use as little as absolutely possible. Put it on a piece of baking paper. Leave it to raise approximately another 30 minutes. Brush the entire visible surface with a little milk. Score the bread with a very sharp knife or a bread knife. I usually use a bread knife. Bake for about 30 minutes at 180°C (355°F) convection, or 200°C (390°F) degrees normal. The biggest problem with home-baked bread is often that it collapses and becomes flat. This typically happens if you don't shape it properly. 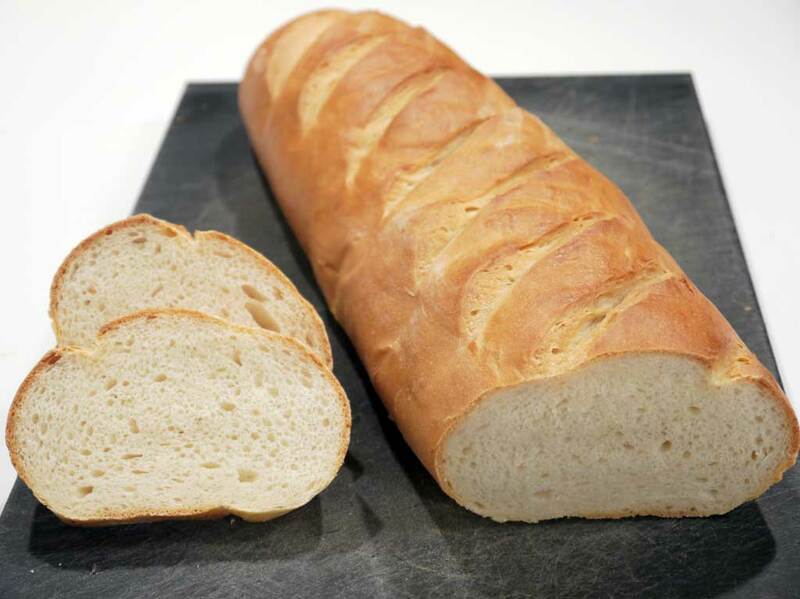 The tight surface that you make with proper shaping helps the french bread to get its spring. When the bread raises it can easily form a thin dry crust on the outside of the dough. This does that the bread cannot grow inside the oven. This is why we scorer it. To break the crust. If we don't score, the bread will become denser, less airy and a lot smaller. When you start to knead the dough it may seem a little too wet and sticky, but it disappears while you knead. The milk is kneaded into the flour. I would strongly recommend a mixer for this recipe. It's much easier. This kind of bread is quick and easy to make. At least if you have that mixer. Unfortunately, it also means that you do not get all the flavor out of the flour. That is why you use milk and butter that has some flavor. You may want to sprinkle it with poppy seeds after you have brushed it with milk.